Sometimes you may find that your Mac OS X installation has an old URL for the software update service in its preferences, which may mean that you can’t successfully run the Software Update tool under the Apple menu. In my case, I got my Mac from my university and the update server was set to some internal server in their organisation. This server didn’t seem to have the latest updates, and half of the time I couldn’t even connect to it. Open the /Library/Preferences folder on the main hard drive. Find the com.apple.SoftwareUpdate.plist file and move this to the desktop (the easiest way is just to drag and drop the file to the Desktop). 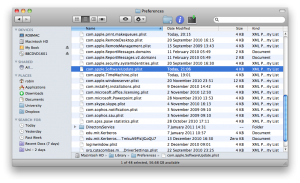 If you find a similar file with a .apple at the end (com.apple.SoftwareUpdate.plist.apple) then move that too. Moving them to the desktop means that you can restore them if this goes wrong. Thank you for this – a really useful bit of info and solved my problem in two minutes! Jacob – I have been looking everywhere today get this done. This is the one that did it. I brought home an office iMac that was using the office server for updates. I used the Software Update enabler. deleted the .com.apple.softwareupdate.plist and about a 20 other things I read. Yours got ALL the references out. It took about 5 minutes for it to run but now updating everything! Thanks. Thanks for the feedback – I’ve updated the post to make it a bit clearer. 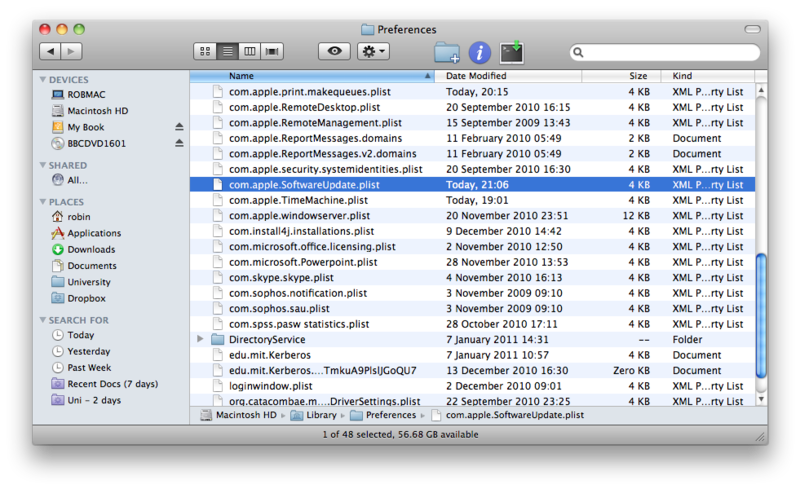 I opened the updater after moving the com.apple.SoftwareUpdater.plist but nothing changed. Did you mean to completely delete it from the listing? Hi! I completed all the steps but when I run the software update tool, the same error message about not being able to access the server (the old one linked to my school) pops up. After I replaced the file (in step 4) I still got the same message. Is there a solution? Thank you sir, I do not understand why this is not published by Apple – so brilliantly simple. A bit late now, but if you get your Mac second-hand “from your university” or anywhere else you should wipe the disk and reinstall the OS. If you’re using the OS that anyone else installed, you don’t know what settings have been applied. To say nothing of malware, whether by incompetence, accident or ill-will.